An all-in-one test strip that covers pH, nitrite, nitrate, calcium and alkalinity? YES! The new Aquavital Marine-Test 5in1. For many years, the well-known AQUAVITAL MULTITEST 6in1 has been sold for freshwater aquariums. Now Aquarium Münster is introducing a new quick test for marine aquariums. 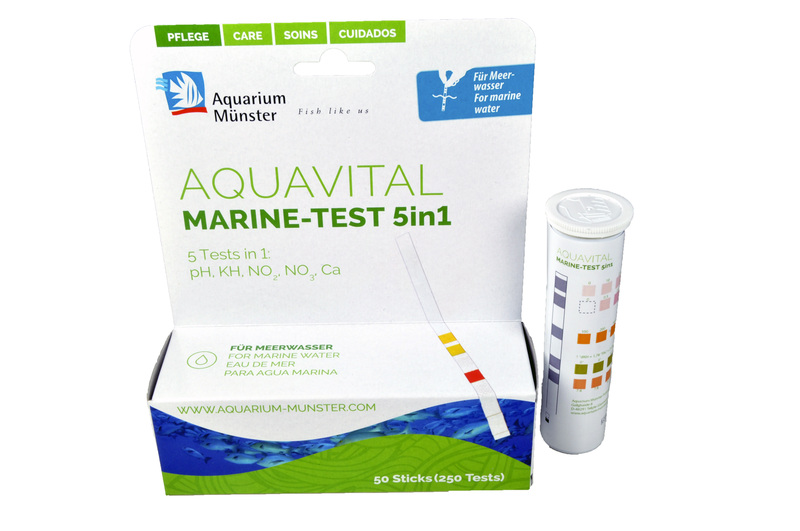 The AQUAVITAL MARINE-TEST 5in1 allows you to quickly, easily, and reliably determine the five most important parameters for marine water: pH, carbonate hardness (KH), nitrite (NO2), nitrate (NO3), and calcium (Ca). Even inexperienced aquarists can quickly obtain a reliable water analysis with the AQUAVITAL MARINE-TEST 5in1. Simply dip the test strip into the water for one second, then shake off the excess water. After waiting for about one minute, compare the color fields on the test strip with the provided color scales on the tin. Dip a strip. One minute later, you have the results for five of the most important and frequently tested parameters in a marine aquarium.